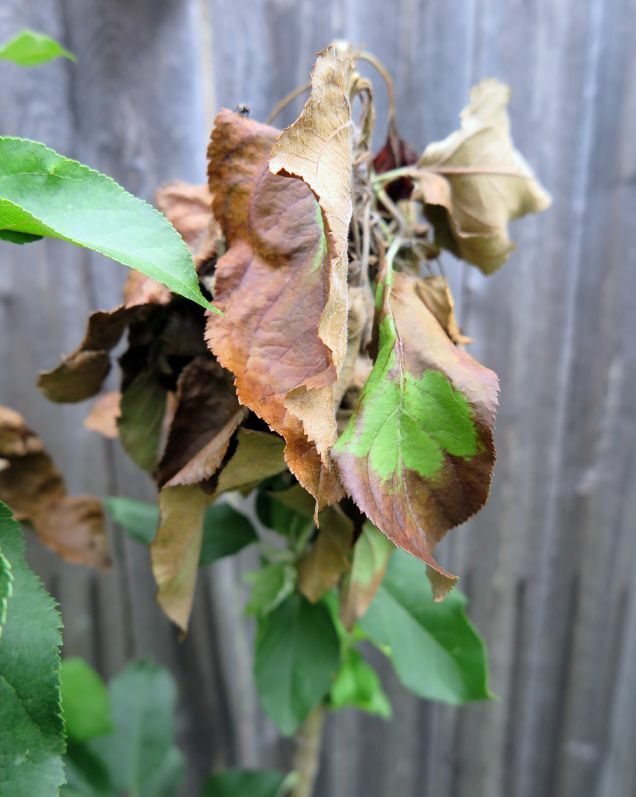 Fire Blight is a very destructive bacterial disease that infects pear and apple trees. The bacterium, Erwinia amylorva, can also infect related plants such as pyracantha, cotoneaster, hawthorn, quince and rasberry plants. In the early stages of infection, the flowers will look watersoaked and then turn brown or black. Then, several weeks after the petals drop, young leaves and stems will turn brown or black and bend over. The disease will spread downward through the plant and can ulitimate kill it very quickly. While it’s best to avoid planting suceptible varieties, once plants are infected only strategic pruning using appropriate techniques can slow or stop the disease. If you have small or young trees that are infected, you’ll need to immediately prune out infected shoots. Cuts should be made at least 8-12 inches below the margin of visible infection. Be sure to sterilize your pruners between cuts. Commercially, antibacterials are sometimes applied at bloom time to susceptible plants in fruit orchards. If you have a large tree that has fire blight, such as an ornamental pear, a professional tree care company should be hired to perform proper pruning and apply any necessary treatments.